Have you ever heard the phrase, "to be one, ask one," or seen a bumper sticker that looks like the image to the left? The reason for that is; it is the first step in petition a lodge of Masons for membership. Many people assume that the only way that they can join a Masonic Lodge is by being asked to join. In fact it is the exact opposite, if a person would like to join a lodge they must ask for a petition. The first step then, the petition a lodge is ask a member for a petition. Under the Grand Lodge Code of Utah, a person who wishes to petition a lodge must know a Mason for a minimum of six (6) months. What if you don't know a mason? Canyon Lodge #13, and many lodges in the State of Utah, have monthly Meetup groups for interested individuals to meet members and get their questions asked and answered. Canyon Lodge #13's Meetup is on the 1st Saturday of the Month, at 9:00am at the Outpost Cafe in Midvale Utah. 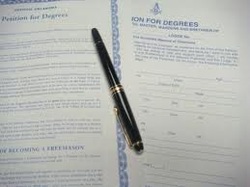 If you do know a Mason but they may not belong to Canyon Lodge, print off the Petition for Degrees, get the proper signature's for recommendation, and turn in your petition to the Secretary of the Lodge. We still recommend you visit our Meetup so that you can get to know the brethren of the Lodge. So, you've turned in your petition and you've waited to hear from the Lodge, what's going on with the Petition Process? Once you have turned in your Petition to the Lodge, the Secretary of the Lodge reads it at the Lodge's next stated meeting (for Canyon Lodge #13 that Stated Meeting is the 1st Tuesday of the Month, except for the months of July and August in which we don't meet). If you turned in your petition during the middle of the month, you won't hear anything until after the next Stated Meeting. Once the Secretary reads your petition at the Lodge Meeting, the Worshipful Master will assign an Investigative Committee to "investigate" your petition. Fairly soon after the Stated Meeting in which your petition was read, the chairman of this Investigative Committee should contact you and arrange a time to meet with you. The Investigative Committee will meet with you and ask some general questions to find out who you are. If you meet the requirements to join the lodge, if your family is supportive of the idea of you joining the fraternity, if you understand what the organization that you're wishing to join really is, etc. This is also an opportunity for you to ask questions to the Investigative Committee as well. This process sounds a little daunting, but it really is a laid back situation that everyone involved in should feel comfortable with. As well, the Investigative Committee will contact your Masonic Recommenders and Personal References. At the next Stated Meeting, the Investigative Committee will report to the Lodge on their committee's work, this only entails a favorable or unfavorable recommendation for the Lodge to determine when the members vote on your petition. Every member of the lodge who is present at that meeting will then vote on your petition. After the vote is made, the Secretary of the Lodge will contact you regarding the outcome of the vote and schedule your Entered Apprentice Degree.